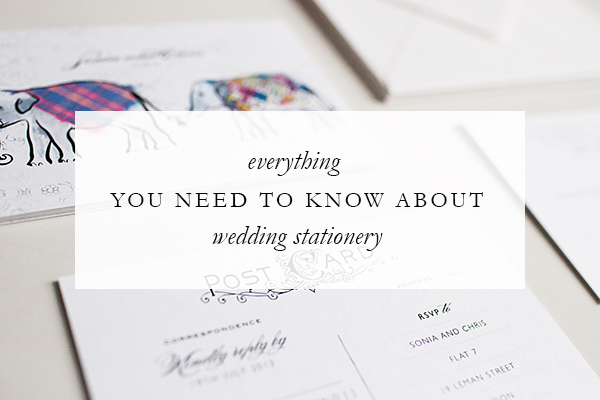 With the launch of the new regular feature ‘Everything you need to know about wedding stationery’ earlier today, let’s start as we mean to go on and follow up with the very first post in the series. How many invites do I order? A common mistake newly engaged couples make when ordering stationery is the quantity of invitations they need. You will be sending one invitation per household, not per guest. Cohabiting couples receive one invitation and for couples living apart, I suggest sending one invite to the guest you’re closer with and including both names on the envelope and invitation. Families should receive one invitation and traditionally children over 18 who live at home or away should receive their own invitation. Take a look at your guest list and count how many houses need invitations before you give your stationer the final number. I always recommend that my couples order enough invitations for their guest list, plus at least 10 extra sets for any last minute guest list changes, damages or lost in the post or if you plan on sending invitations to a “B-list” to replace guests who can not attend. From experience there is always extra guests added to the most final of lists. It’s better to order a few extra invites initially, rather than having to re-order more later which can be expensive. Especially if you are having letterpress or foil printed pieces as there is usually a minimum run of 30 so it may not even be possible to order just a couple more a few weeks later. Don’t forget, you might want to keep one as a keepsake too! Also consider ordering extra envelopes to allow for addressing errors and if you’re hiring a calligrapher they usually request approx. 15%-20% extra invitations/envelopes for inevitable addressing mistakes. Ta da, first post done! I hope you found this helpful, these posts will be filed under ‘need to know basis’ in the categories on the right so you can use this resource whenever you need with ease. It’s not every day you order your wedding stationery. How are you suppose to know what a save the date is or when you should send out your invites?! Brides and Grooms quite rightly have a ton of questions and I am pleased to help as much as I can throughout the ordering process. There can be a lot to consider but it shouldn’t be overwhelming, the whole experience should be easy and fun! There are naturally a few reoccurring questions that I’m asked with each new enquiry but I also feel newly engaged couples could benefit from more detailed information that doesn’t seem to be readily available to them. This is why I’m launching a new, regular blog post where I offer a nugget of advice, a tip or just useful information in small, pretty, uncomplicated posts that couples can use as a planning tool – an archive for all things wedding stationery. 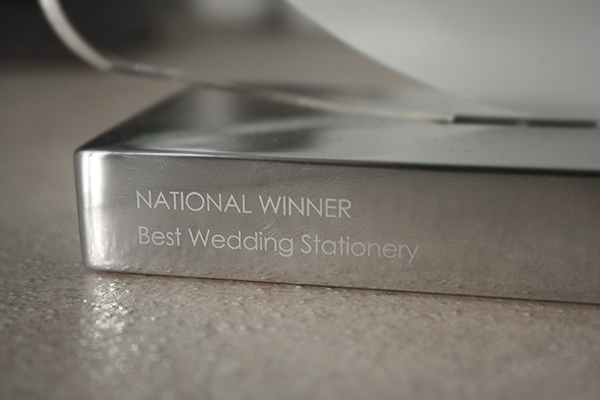 I help provide advice when ordering stationery everyday and there are a few questions I get asked most often so I thought it would be good to share with you a few hints and tips when ordering your wedding stationery. Start the stationery process as soon as you can, ideally as soon as you have booked the venue. Avoid any stress and rush charges and give yourself time to choose inks and check proofs. If you looking at commissioning bespoke stationery, think about the design and theme of your invites and any coordinating stationery you would like. A great starting point is to gather imagery, swatches as well as your ideas, these details you provide really make your stationery special and personal. 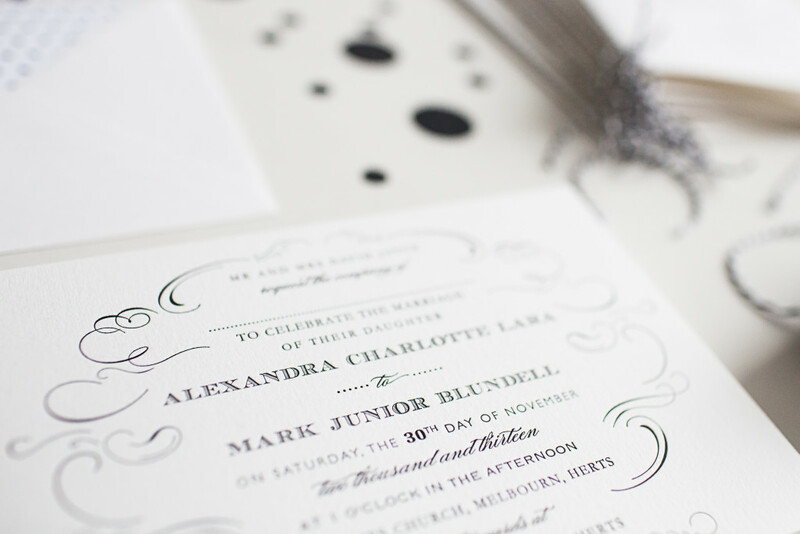 When should you send out your invitations? Aim to send out your invites 6 weeks to 3 months before the wedding so I recommend starting the ordering process at least 2 months prior to this. Not sure when to set your reply date? This may depend on your caterers and other vendors but I recommend setting it one month before your wedding. This will give you plenty of time to follow up any late responses and really helps to finalise any remaining items like table plans and personalised place cards earlier. Giving yourself this extra time will prevent any unnecessary stress close to the big day. If you are sending out Save the Dates look to do this 6 – 9 months before the wedding or even earlier if you are having a destination wedding. Save the Dates are a great idea if the wedding falls on a holiday period or mid week to give your guests plenty of time to arrange their plans. When deciding on numbers work on the basis of one invite per family or couple not person and include any family and friends that you know won’t be able to attend but would appreciate receiving an invitation. Top Tip: Order an extra 10 to 20 invitation sets for any last minute guest list changes, this also allows for any addressing mistakes. It’s cost effective to order these now, reordering a small number of items at a later date can be really expensive. Remember colour resolution can vary drastically between computers and electronic proofs should be used as a guide only. If there is a particular colour you would like I always recommend sending a swatch in the post. This hard copy can then be matched to an ink as closely as possible. Would love a two colour letterpress design but on a tight budget? 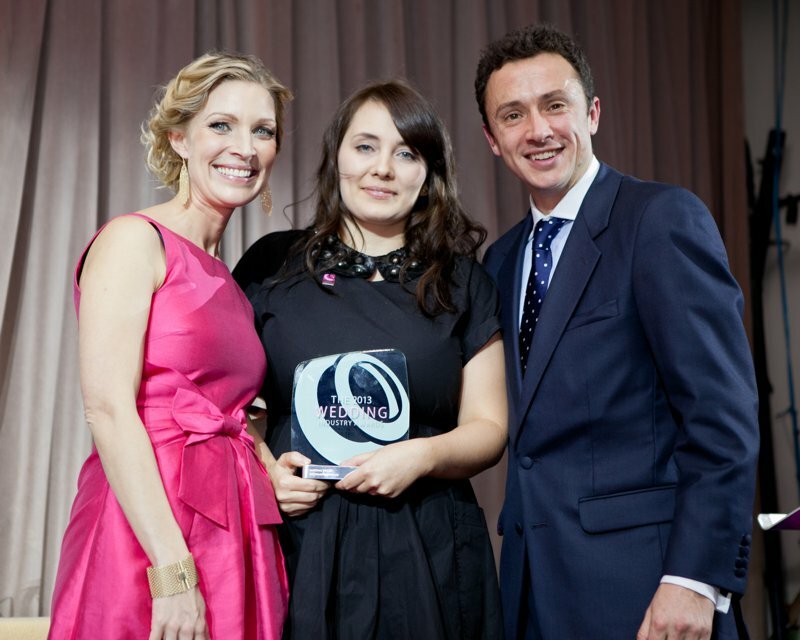 There are plenty of options to tailor your stationery requirements to suite all budgets. Choose two colours for the main invitations and just one colour for all coordinating items or print your stationery in one colour and include envelope liners to add an additional colour. I hope these little tips help to make ordering your stationery easy and as stress free as possible!